Vernon Lowell Ullestad of Story City passed away at Bethany Life Communities on October 3, 2018, at the age of 92. Vern was born on May 30, 1926 in rural Radcliffe, Iowa to Jacob and Helena (Hodnefield) Ullestad. After graduating from Radcliffe High School in 1944, he entered the United States Navy at the end of WWII where he proudly served his country as a ship radio operator. After returning home from the service, he was united in marriage to Marjorie Lund on December 3, 1949 at Immanuel Lutheran Church in Story City. Together they raised five children. Marjorie passed away in 2011. Vern was an idea man, entrepreneur and cowboy at heart. He owned a turkey farm for many years and then developed land in Story City, including two prime residential areas -- one north of the golf course and the other south of the baseball field. Later, he delivered Winnebago motorhomes across the country. In his retirement years, he and Marjorie traveled the craft show circuit country-wide selling their hand-punched and painted luminarias. Vern loved to travel and knew most major roads and highways from coast to coast. He enjoyed meeting and visiting with people wherever life led him. 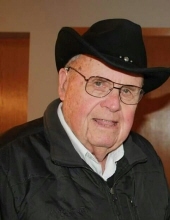 He was proud to live in Story City and was an active member of Immanuel Lutheran Church and the community, serving in various capacities over the years - including Sunday school teacher, church council member, school board member, and more. A good joke was not lost on Vern. He had a great sense of humor and loved to laugh! Two things he took seriously, however, were his faith and his family. He dearly loved his Lord and family with his whole heart. Left to cherish his memory are children Pat (Carter) Holman of Des Moines, Pam (Craig) Amenson of Ankeny, Rod (Sue) Ullestad of Boone, Rita (Mark) Gilbertson of Ames, JoAnn Boothe of Ames; nine grandchildren; twelve great-grandchildren; sister, Hyllis Handsaker of Story City; brother, Argyl Ullestad of Ankeny; brother-in-law, Jack Lund of Western Springs, IL, and many nieces, nephews and friends. He was preceded in death by his wife, Marjorie; parents; brother, Lester Ullestad; sister, Janet Ullestad; and son-in-law, Jerry Boothe. To send flowers or a remembrance gift to the family of Vernon Lowell Ullestad, please visit our Tribute Store. "Email Address" would like to share the life celebration of Vernon Lowell Ullestad. Click on the "link" to go to share a favorite memory or leave a condolence message for the family.